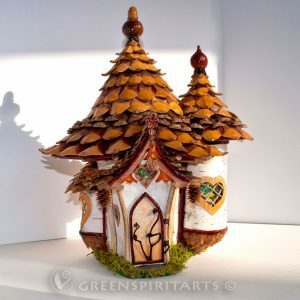 This house is tiny but was such fun to make! It began with the unusually shaped piece of Buck-eye burl which is the base of the structure. 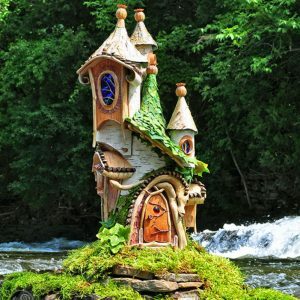 The house is built to conform to its footprint so it is not symmetrical or even terribly practical, but Faeries don’t mind! The house has a single main room with two tiny alcove rooms to either side of the grand entrance-way with a bay window on the back side. Sandstone steps rise from the base foundation to gain access to the double door entrance. The “stained glass” effect on the door and windows is achieved by using real dragonfly wings ( traffic collisions with cars, sadly) and laminating them on thin, transparent films. The frame of the doors and windows are White cedar twigs, collected in the mountains. The door handle is a Golden Maple leaf jewelry finding. The entrance is lighted by an antique Lily bead dangle and faux Amethyst faceted bead sconces to either side of the doors. 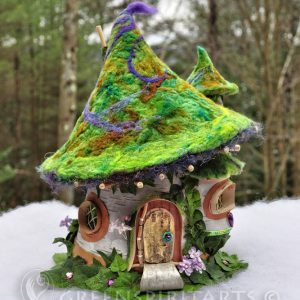 The removable roof is a light White cedar twig frame which has been covered in wool felt and then covered with antique velvet leaves which have been needle-felted in place with novelty yarns and dyed wool to give a natural yet magical mossy look to the roof. 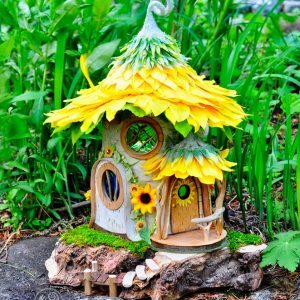 The roofs over each of the alcove rooms plus the roof for the bay window on the back were finished using the same, matching materials. The interior is fully finished with a heathery wool felt carpet, and handmade Japanese paper wallpaper with designs of tiny irises and butterflies sprinkled throughout. Lighting inside and out is from battery-powered micro LED lights with the battery pack being built into the foundation with access being hidden under some foliage in the back. When the lights come on the whole thing glitters and sparkles in a most enchanting way! The name comes from the time when it was photographed out in my garden under a stand of Maidenhair ferns.